Beauty, craftsmanship, and reliability are all hallmarks of the La Nordica cookstoves line. One of our favorite manufacturers, La Nordica hails from Italy and the prestigious culinary history of the Italians really shines through in their stoves. From the aesthetics to the engineering, you can’t go wrong with La Nordica. Even better: These cookstoves are all EPA exempt, meaning you can install them anywhere in the U.S. worry-free! The Rosa Maiolica is, in our opinion, La Nordica’s most visually stunning stove and one of the best looking cookstoves on the market. Available in sleek burgundy red, cappuccino, and white, the Rosa becomes a centerpiece in whatever room it’s installed in. You might think you would be paying out the nose for those looks, but the reality is that these are half the price of other top of the line stoves like the Esse Ironheart. 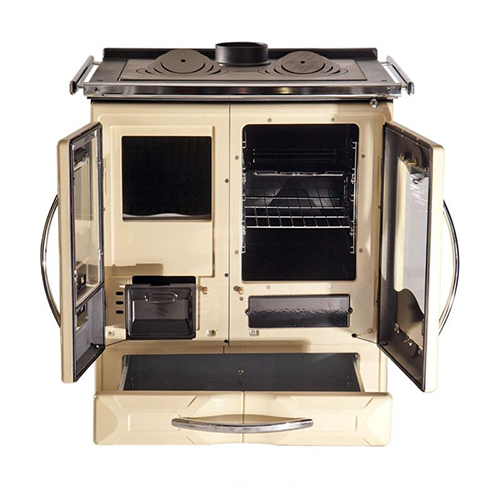 The Rosa offers sturdy construction and engineering, using a combination of cast-iron, ceramic tile, sheet metal (for the oven, body of the stove, etc. ), and stainless steel for anywhere that creosote will accumulate. The body of the stove has a hardy, thick steel frame, and the all-porcelain oven makes for easy cleaning. 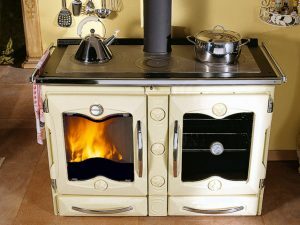 Also, gone are the days of having to replace poorly made components every few years, because the Rosa’s hinges and latches are all made to the highest standard, and the castings are among the best quality of any stove we’ve seen in our long history of using cookstoves. 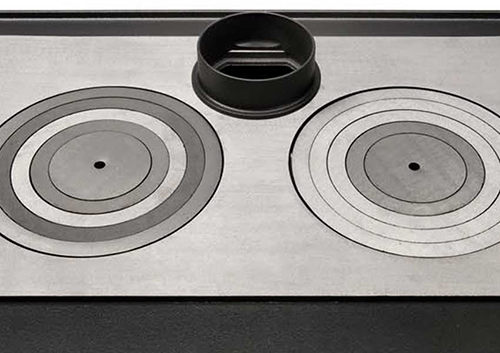 This stove is designed by stove users, for stove users. La Nordica knows what customers want, a fact that becomes exceedingly clear with the features the Rosa offers: The large glass doors on the firebox and oven mean that you can keep an eye on your cooking and light up any room with the warm ambience of the fire. 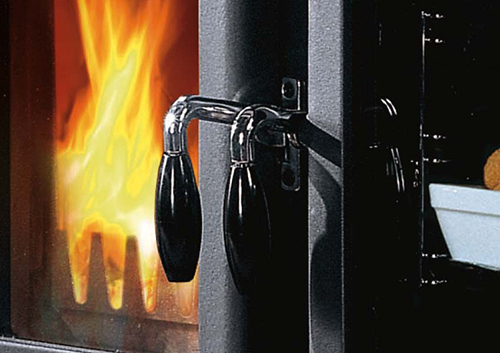 The firebox may not be the largest on the market, but the stove burns at an amazingly economical rate. While La Nordica cookstoves are not heat rated stoves, the Rosa is perfect as an additional heat source or to take the edge of that morning chill. With the Rosa, you’ll waste less wood and get more heat for cooking, without having to purchase a stove that takes up half of your living room. Let’s not forget though: Cookstoves are for cooking, and the Rosa doesn’t neglect that for one moment. The oven door has a thermostatic probe installed directly into it, allowing you to get temperatures from inside the oven with just a glance, and there’s even a warming oven neatly designed into the stove just below the oven. Want pizza? Cook it in the oven, then toss it in the warming oven to keep those slices coming hot until you’re full. When you’re not using the oven, simply push in a lever to disengage it and presto! 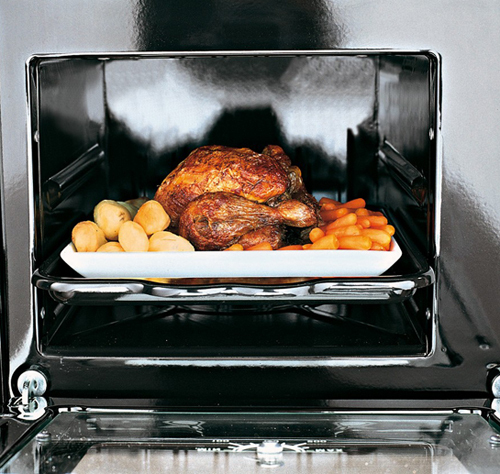 You can keep all that heat from the firebox radiating into the room without wasting it on a meal you’re not cooking. If you’re after a stove that stands out with style but maintains a low physical profile, the La Nordica Rosa Maiolica may be just what you’re after. While not as visually striking as the Rosa Maiolica, La Nordica’s Italy line of cookstoves features an exterior that is simple, yet elegant. We love the feel of this model, and the subtle class it can bring to a room. Of course, the modern exterior of the Italy hides a true workhorse underneath. 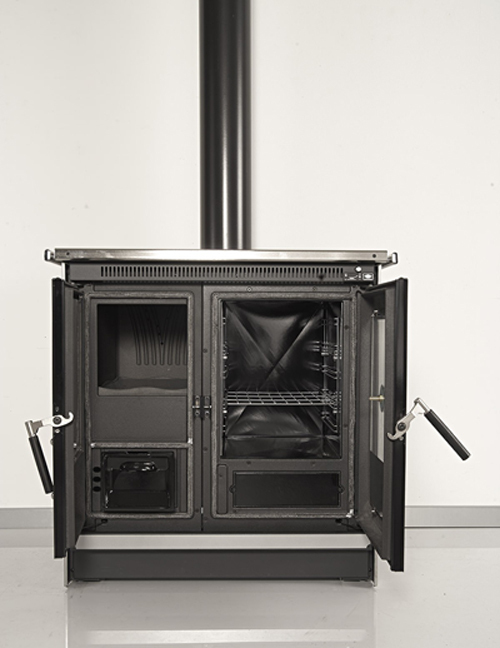 If you want auxiliary heat from your cookstove, look no further: The Italy is the best heating cookstove that we’ve ever tested, thanks to a secondary air injection system that allows it to burn better than any of La Nordica’s other cookstoves. By igniting the gases released from the wood during a burn, the Italy offers you not only additional heat but better efficiency, coming in at 77.8%. 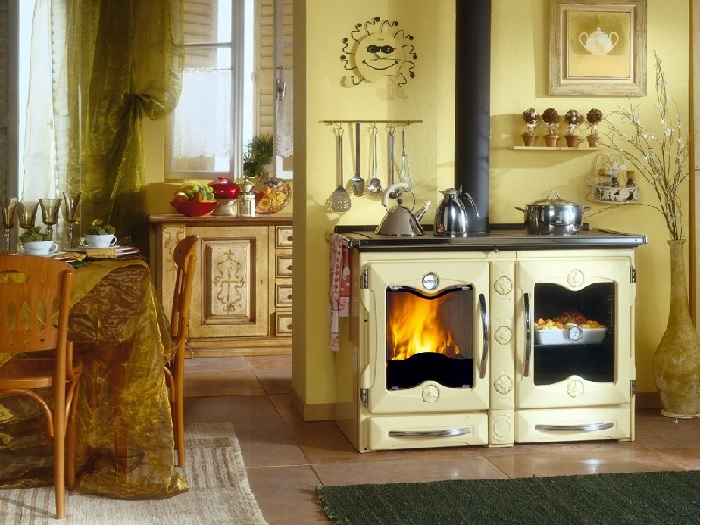 We’ve personally seen the Italy generate over 8.5 hours of heat on just three to four pieces of wood; quite the feat for any cookstove. 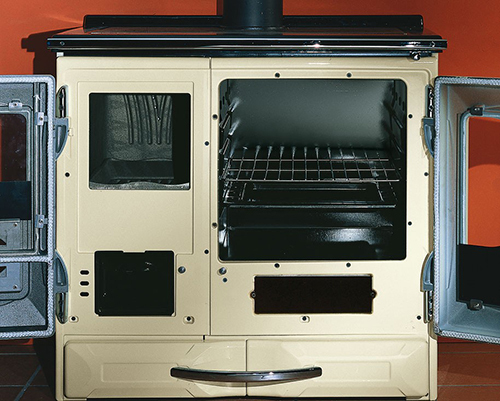 The Italy is slightly smaller than the Suprema, making it La Nordica’s chief mid-size cookstove. It offers a few more cooking options than the Rosa, with two hot plates and an oven with more space than any other that La Nordica offers. Plus, you can easily hit 400 degrees in less than 45 minutes, so you won’t be waiting around too long for those big meals to finish after putting them in. 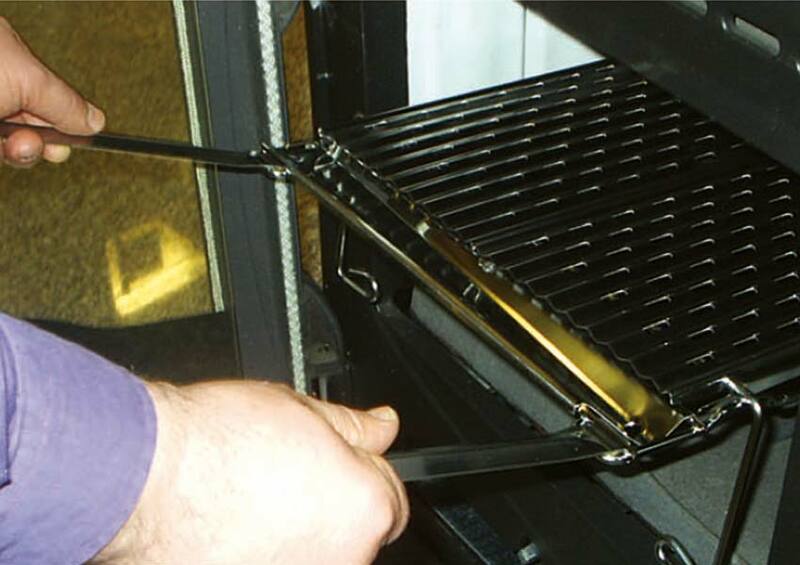 You can also control the oven separately from the firebox, just as you can with the Rosa. 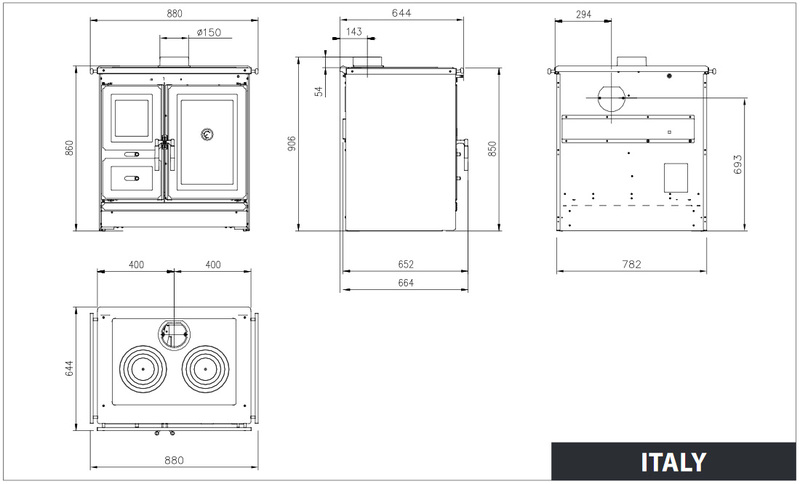 As with the other cookstoves that La Nordica offers, the Italy has outstanding casting work and you can expect the hinges and latches to last for many, many years to come. 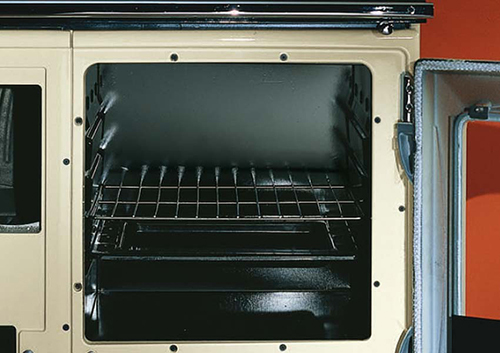 The ash pan is made from sturdy cast-iron, and an additional inner-layer of glass on the firebox door keeps the glass on the outside from getting too hot. It’s a thoughtful addition, given the amount of glass on the front of this stove and the likelihood that you will accidentally bump into it eventually. 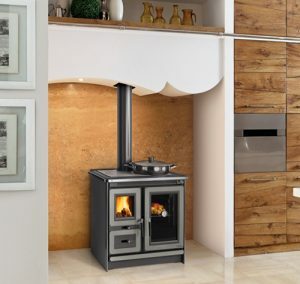 While we had some initial doubts about the Italy due to some sheet metal panels that seemed a little less than well-put-together, the Italy has captured our hearts with its ability to put out a remarkable amount of heat for a cookstove while offering just as many bells and whistles in the oven as any other stove on the market. 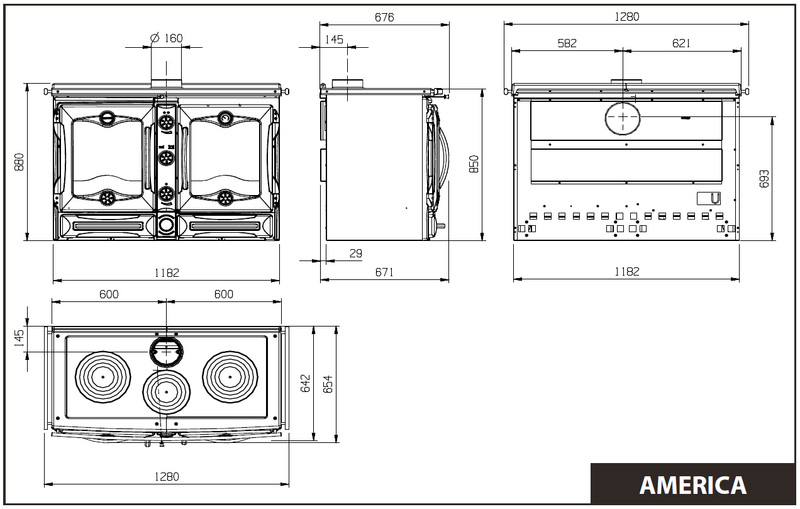 After a cookstove that will keep you not just warm but full all winter? This is the one for you. The La Nordica Suprema sits somewhere between the Rosa and the Italy in terms of looks: Featuring the attractive European style that the La Nordica line is known for, the Suprema has a classic aesthetic without being antiquated. 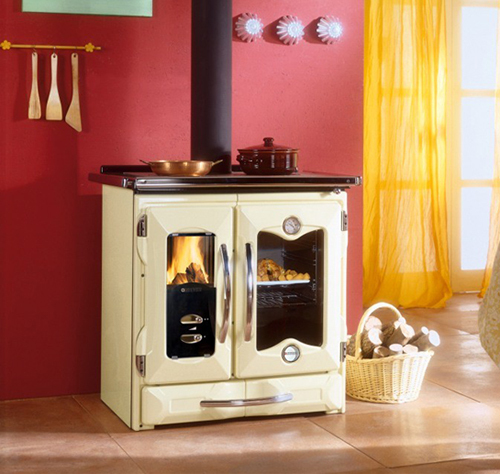 It’s not as bold as the Rosa, but it feels rooted in the traditional cookstove look that we have all come to know and love. Unlike other cookstoves in the La Nordica line, the Suprema relies on radiant heating rather than convective. We typically prefer stoves that are convective, as convection works with physics to heat the air of a room, while radiant heat is mostly absorbed by objects and people. As a result, convective heat tends to be more effective. While the Suprema doesn’t give off as much heat as other cookstoves from La Nordica, it still heats relatively well for what it is, which is a secondary heat source. You can expect to easily heat smaller areas (up to 1,500 sq. feet) for around eight hours on an economical amount of wood, so it’s perfect for vacation homes or weekend retreats. The firebox is also a bit larger than the Rosa’s, and features a cleverly designed self-closing door for safety (no risk of accidentally leaving it open!). We can’t honestly knock the Suprema too hard for being radiant, given the main attraction is the oven. 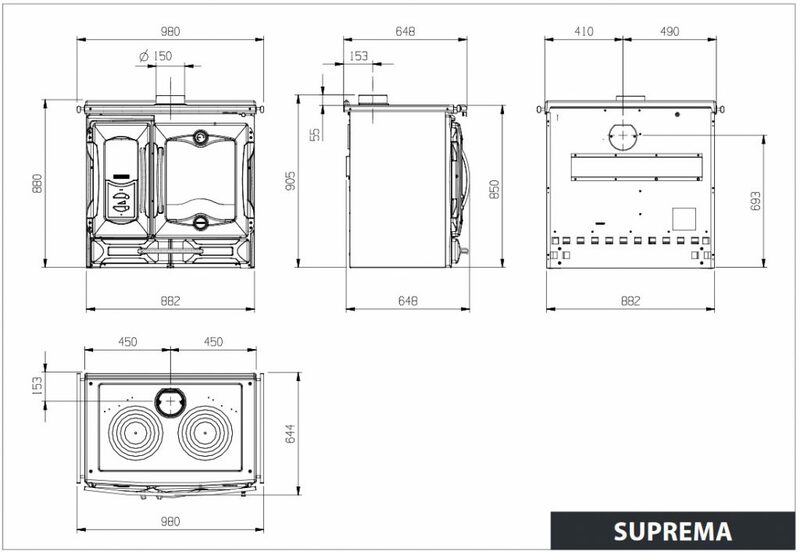 Speaking of the oven, the Suprema’s is superbly well-designed with both a rack and a pan included, allowing you an instant variety of meal options, and a handy pan drawer at the bottom for easy storage. 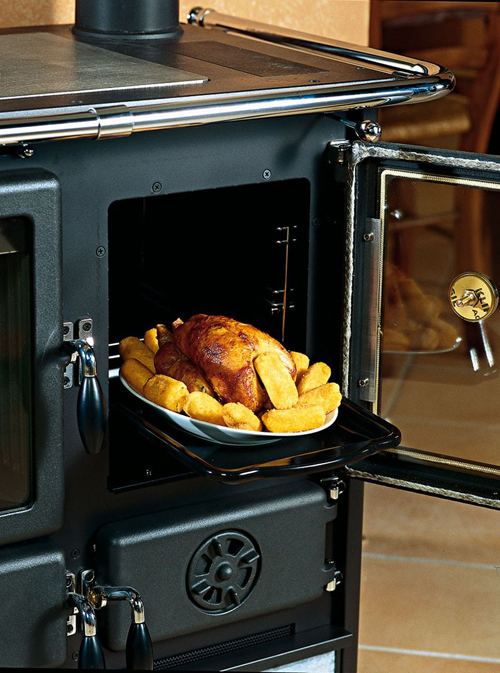 Unlike the firebox, the oven does not feature a self-closing door, meaning you won’t struggle to put a meal in. This is a thoughtful design decision on La Nordica’s part, and speaks to how much attention they pay to the little details. 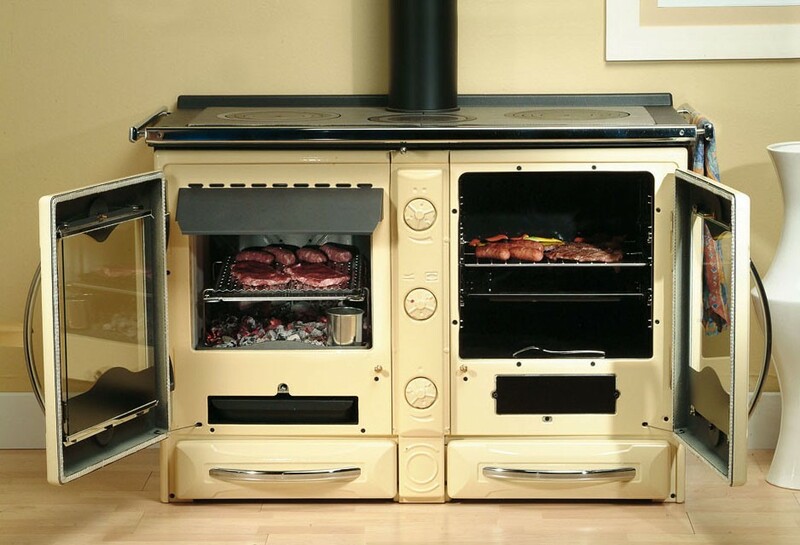 It’s also a massive oven: If you want a cookstove that can cook just about anything, look no further. This is the chef’s friend of the La Nordica line, and it has our eager recommendation to anyone who plans to do more cooking than heating with their cookstove. The build quality is, as we’ve come to expect from La Nordica, outstanding. The doors, cooktop, and stove front are all cast iron, while the sides and body are porcelain sheet metal for effective radiant heat, allowing no cool air into the stove. 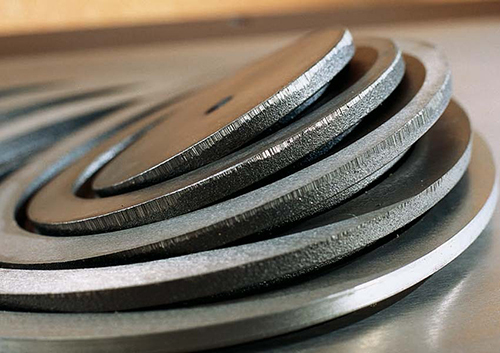 All castings are top of the line too, in keeping with the other models from La Nordica. 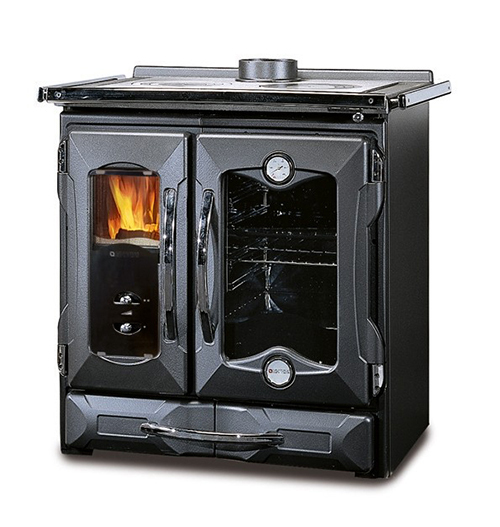 One of our favorite aspects of the Suprema is the firebox window design. It’s triple-paned, with an outer shield protecting two layers of inner glass and an air wash system that allows air to flow over the glass, keeping it cool and clean. You can literally stick your hand on the glass with a blazing fire, it’s that cool! Since you’ll be spending a lot of time cooking in front of the stove, this is especially important as it will keep you from any accidental burns while still allowing you to enjoy the ambiance of flames. All things considered, the Suprema is not heat rated and would not be ideal if you want a lot of heat for a medium to large-sized room, but the oven is the clear winner out of all of La Nordica’s products. For its size and beautiful style, the Suprema is an incredible value for the price. 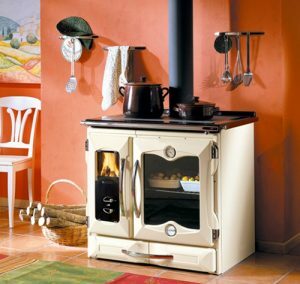 Stylistically similar to the Suprema, La Nordica’s America cookstove is rooted in tradition with an edge of modernity. Its uniqueness, however, comes from its sheer size. 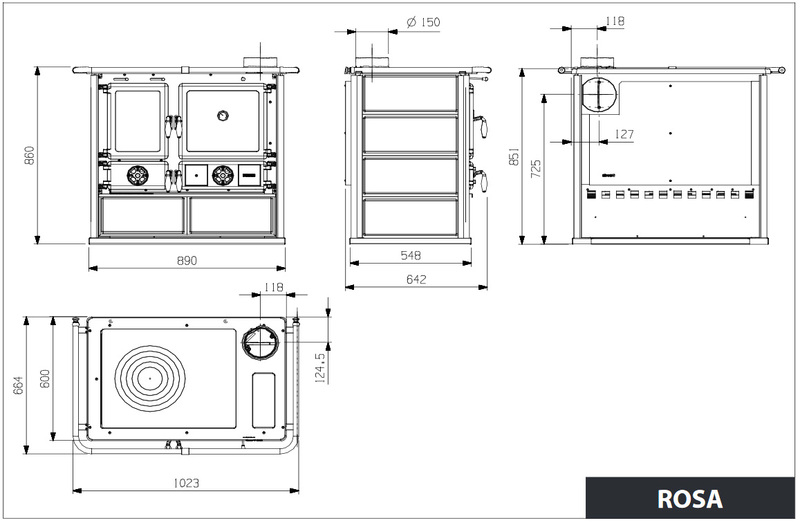 With the largest firebox and largest oven out of any La Nordica cookstove, the America is perfect for anyone with plenty of space and a need for cooking large meals. 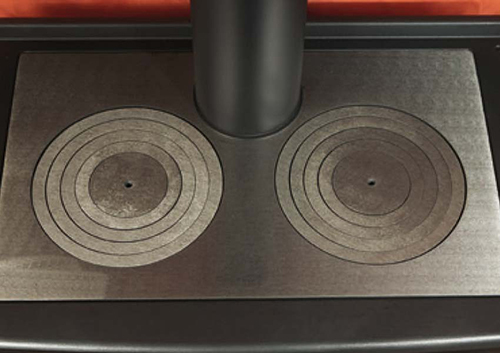 Not only are there three ringed burners on top of the stove, but the cooking grate inside the oven makes for easy home-charcoal grilling and allows for meals that simply aren’t possible on many other cookstoves. 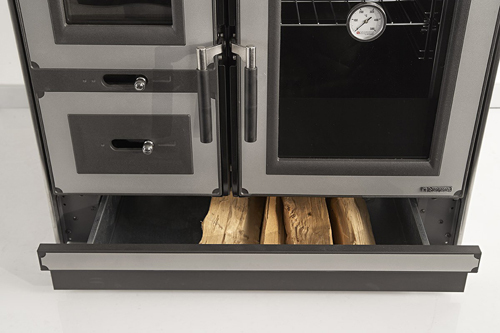 It does consume slightly more wood than the other La Nordica models (7 lb/h), but when heating an oven of this size that’s to be expected, and we really have no complaints about about the fuel consumption overall. The America cookstove is certainly large, but one of the things we appreciate about it is the abundance of storage space. This is often overlooked by manufacturers and customers alike; you may have space for the stove, but what about all the things that go with it? 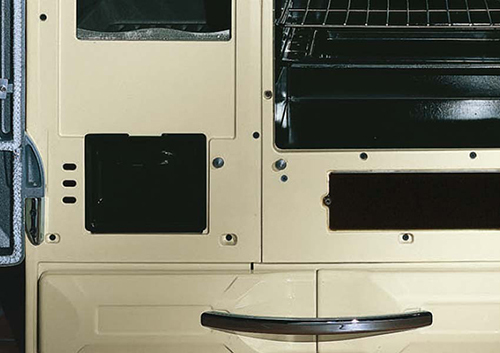 By adding spacious draws on the underside of the unit, you can be sure that all your wood and stove accessories stay out of the way and out of sight, allowing the considerable good-looks of the America to stay clean and uncluttered. Heating Capacity Up to 1,200 sq. ft. If the dimensions and specifications of the Italy are right for you, but the simplified look is not, then La Nordica’s Mamy is a fine alternative. 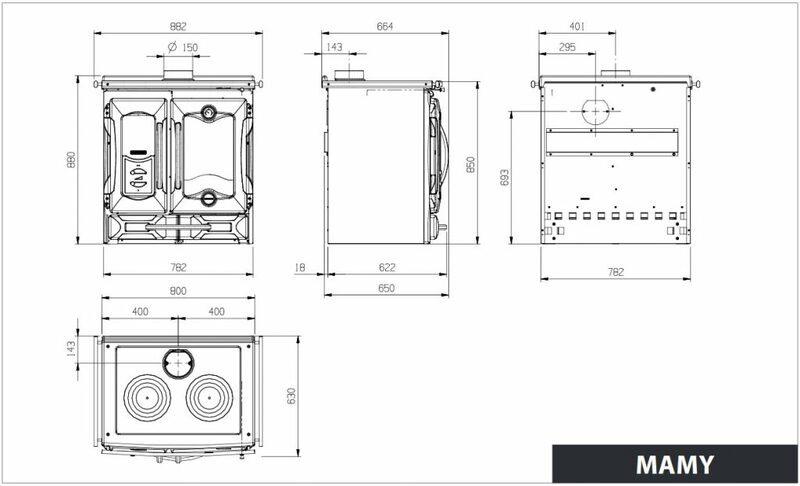 With an aesthetic that is essentially a slenderized version of the Suprema, La Nordica’s Mamy wood cookstove combines two fine stoves into one, resulting in a model that mixes together many fine characteristics that are hallmarks of La Nordica. 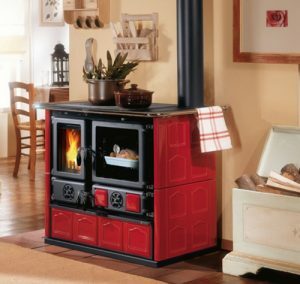 The Mamy’s exterior is composed of enameled cast-iron, which gives a lot of durability to its eye-catching looks, and the frame, plate and rings are all made from straight cast-iron, ensuring that your stove parts will last for decades to come. You also have the ability to modulate primary and secondary air separately, a feature that adds a huge degree of control over your cooking. Plus, with 27,000 BTU/h of heat, the Mamy can handily heat your retreat or just add that little extra bit of warmth in the morning as a secondary heater. 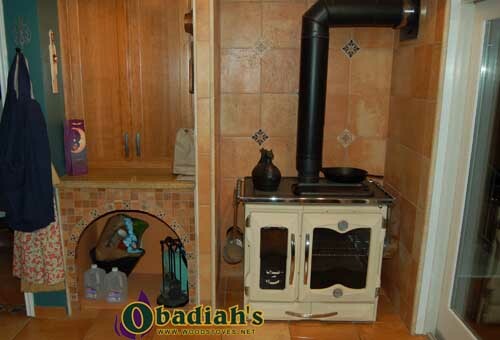 La Nordica cookstoves and more can be found at Obadiah’s Woodstoves and Alternative Energy!